The two photos below (click to enlarge) were taken 4 years apart. The one on the left was taken in 2006, when I weighed 210 lbs (95 kg). Since my height is 5 ft 8 in, at that weight I was an obese person, with over 30 percent body fat. 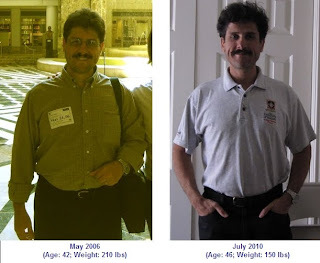 The one on the right was taken in 2010, at a weight of 150 lbs (68 kg) and about 13 percent body fat. I think I am a bit closer to the camera on the right, so the photos are not exactly on the same scale. For a more recent transformation update, see this post. My lipids improved from borderline bad to fairly good numbers, as one would expect, but the two main changes that I noticed were in terms of illnesses and energy levels. I have not had a fever in a long time. I simply cannot remember when it was the last time that I had to stay in bed because of an illness. I only remember that I was fat then. Also, I used to feel a lot more tired when I was fat. Now I seem to have a lot of energy, almost all the time. In my estimation, I was obese or overweight for about 10 years, and was rather careless about it. A lot of that time I weighed in the 190s; with a peak weight of 210 lbs. Given that, I consider myself lucky not to have had major health problems by now, like diabetes or cancer. A friend of mine who is a doctor told me that I probably had some protection due to the fact that, when I was fat, I was fat everywhere. My legs, for example, were fat. So were my arms and face. In other words, I lot of the fat was subcutaneous, and reasonably distributed. In fact, most people do not believe me when I say that I weighed 210 lbs when that photo was taken in 2006; but maybe they are just trying to be nice. If you are not obese, you should do everything you can to avoid reaching that point. Among other things, your chances of having cancer will skyrocket. So, I lost a whopping 60 lbs (27 kg) over about 2-3 years. That is not so radical; about 1.6-2.5 lbs per month. There were plateaus with no weight loss, and even a few periods with weight gain. Perhaps because of that and the slow weight loss, I had none of the problems usually associated with body responses to severe calorie restriction, such as hypothyroidism. I remember a short period when I felt a little weak and miserable; I was doing exercise after long fasts (20 h or so), and not eating enough afterwards. I did that for a couple of weeks and decided against the idea. There are no shortcuts with body fat loss, it seems. Push it too hard and the body will react; compensatory adaptation at work. My weight has been stable, at around 150 lbs, for a little less than 2 years now. - Complete removal of foods rich in refined carbohydrates and sugars from my diet, plus almost complete removal of plant foods that I cannot eat raw. (I do cook some plant foods, but avoid the ones I cannot eat raw; with a few exceptions like sweet potato.) That excluded most seeds and grains from my diet, since they can only be eaten after cooking. - Complete removal of vegetable oils rich in omega-6 fats from my diet. I cook primarily with water. I also use butter and organic coconut oil. I occasionally use olive oil, often with water, for steam cooking. - Consumption of plenty of animal products, with emphasis on eating the animal whole. All cooked. This includes small fish (sardines and smelts) eaten whole about twice a week, and offal (usually beef liver) about once or twice a week. I also eat eggs, about 3-5 per day. - Practice of moderate exercise (2-3 sessions a week) with a focus on resistance training and high-intensity interval training (e.g., sprints). Also becoming more active, which does not necessarily mean exercising but doing things that involve physical motion of some kind (e.g., walking, climbing stairs, moving things around), to the tune of 1 hour or more every day. - Adoption of more natural eating patterns; by eating more when I am hungry, usually on days I exercise, and less (including fasting) when I am not hungry. I estimate that this leads to a caloric surplus on days that I exercise, and a caloric deficit on days that I do not (without actually controlling caloric intake). - A few minutes (15-20 min) of direct skin exposure to sunlight almost every day, when the sun is high, to get enough of the all-important vitamin D. This is pre-sunburn exposure, usually in my backyard. When traveling I try to find a place where people jog, and walk shirtless for 15-20 min. - Stress management, including some meditation and power napping. - Face-to-face social interaction, in addition to online interaction. Humans are social animals, and face-to-face social interaction contributes to promoting the right hormonal balance. When I was fat, my appetite was a bit off. I was hungry at the wrong times, it seemed. Then slowly, after a few months eating essentially whole foods, my hunger seemed to start “acting normally”. That is, my hunger slowly fell into a pattern of increasing after physical exertion, and decreasing with rest. Protein and fat are satiating, but so seem to be fruits and vegetables. Never satiating for me were foods rich in refined carbohydrates and sugars – white bread, bagels, doughnuts, pasta etc. Looking back, it almost seems too easy. Whole foods taste very good, especially if you are hungry. But I will never want to each a peach after I have a doughnut. The peach will be tasteless! With diets in general people fail becuase as you said, there is no short-cut, removing SC fat is a slow and almost meticulous process. In this day and age we are forever looking for short-cuts. Also, diets fail becuase people go back to thier old eating habbits once they lose the weight, thinking they are invincible. Its hard to accept, but once you have lost alot of weight, you have to constantly monitor what you eat, otherwise refined foods will creep back in. There is alot of research out recently that self-control, restraining yourself etc, is not an infinite pool of will power as many would have us believe, but istead it is a well defined and exhaustable pool of neurons that like any other neuron will stop firing once it becomes saturated. One question though Ned, do you have loose/sagging skin? At my thinnest ( 160lb, 5'10 tall ) I had a tiny bit of skin sag from my belly after previously being 205lbs. Actually I still have a small amount of lower ab fat. I plan on losing it without any weight loss (i.e., staying at the current weight), which implies muscle gain together with fat loss. Veeery difficult, and veeery slow. Regarding dieting as restraining yourself, I don't think it works. One has to change his/her mindset, and then things come easy. I think one has to develop a certain dislike for carb/sugar-rich processed foods to easily avoid them. I do, because in my mind I see them as cancer-promoting (which they are). Also, going from a diet with sweets to one without any is tough; but nature gave us fruits, which become very sweet if you stay away from candy. It sounds like you did eat fruit during your weight loss. Can you tell us what fruits and what frequency you at them? (I go back and forth on deciding to eat fruit or not during my weight loss plan). Thanks and congrats on the success. I'm glad you wrote out how you did this. I will be sure to have anyone who asks me about diet to read it. PS Sure you don't want to take off your clothes? I eat 1-2 medium-sized fruits (or equivalent amount) per meal, and typically have 2-3 meals per day. I usually eat the fruits that are in season, which I buy from the local store. This includes bananas, apples, pears, berries, cantaloupe, grapes; whatever is in season. Also, if certain fruits raise your blood sugar levels too much 1 h after eating them (> 140 mg/dl), I'd stay away from those fruits. Shirtless photos are for really athletic folks like you. I saw the interview with Deidra. You look like an Olympic athlete on that shot with the bike! Do you mean you don't eat any cooked plant food? Also, what about juicing? Assuming blood sugar stays below 140, how do you feel about juicing beet/kale 2-3/week? When I spoke of self-restraint I was referring more to people who have lost weight and are at thier goal weight, but end up putting the weight back on in 1-2 years. I must admit that this does include myself although I only regained about 30lbs before I realised im slipping down the slope again and enough is enough. The self-restraint is because basically carb rich refined foods are EVERYWHERE in modern society. I live in london and work in canary wharf and getting a decent lunch is quite the mission on search and rescue! If you want a no nonsense proper weight loss supplement then yohimbine is where its at. Beware though, depending on where you live yohimbine may be classed as a drug. I eat plant foods cooked, but I avoid those plants that cannot be eaten raw. Not completely though; I'll eat sweet and Irish potatoes occasionally. Juicing veggies and fruits is definitely much better than drinking industrialized fruit juices, which are not much better regular sodas in terms of health. But there is a lot of evidence suggesting that chewing your calories is generally healthier than drinking them. Yes, not only are those foods everywhere, but they are also usually cheaper. I take fish oil and niacin. Neither is significantly correlated with body fat loss, according to my numbers. If I were to eat a bit more oily fish than I do, the fish oil would be unnecessary. Niacin is more of an experiment for me. I started it to improve my lipids, and then kept it for the growth hormone effects (see link below). I haven't noticed major effects from niacin, but some effects take time to be noticed. Edit: I added some text on vegetable oils, which I forgot to include in the original version of the post. I use nutritional yeast as a cheese substitute, which has lots of b-vitamins, but it's not even close to the 2g of Niacin for growth hormone secretion. I'll have to check it out! but more because it seems you can't read the news without a positive vitamin d study jumping out! Is there merit to avoiding polyunsatuated/omega3 fats? There is evidence that excessive omega-6 in the form of vegetable oils IS VERY bad, and also that excessive omega-3 in the form of fish oil MAY be bad. Both are essential fats; meaning that they have to be provided by the diet. A whole foods diet will provide enough of these fats. It seems to me that a decent ratio of omega-6 to omega-3 should range from 1 to 4. That's where the fish oil comes in. Fish oil supplements are unnatural, but if you consume mostly grain-fed meat and no seafood, I think it makes sense to supplement. LDL oxidation seems to be caused by a number of things. I think the main culprits are diets rich in refined carbs and sugars, which promote the formation of small-dense LDL particles (which are much more easily oxidized). Excess omega-6 fats tend to induce abnormal levels of inflammation, which indirectly contribute to small-dense LDL particle deposition in the endothelium. Ned, I'd say you have nothing to apologize for on the shirtless photo front. I can't help but notice that in your "after" photo you not only have more hair but your eyesight apparently improved (no glasses). Actually my eyesight has gotten worse due to presbyopia, but since I am myopic I started seeing better without glasses. Some people call this the "myopia payoff" of presbyopia. Great job Ned. You look fantastic. I'm with you-- I can't remember the last time I had a fever. I had a cold in April 09 for a couple of days- but I knocked it out with extra high Vit D for a few days. Ned congratulations man. It is amazing how many in the "paleosphere" have similar stories and histories. When I see overweight people I want to pull them aside and tell them that they don't have to be slaves to food any longer. I want to tell them that real foods are the key to true satiety; that they don't have to suffer. And that they don't have to starve themselves or kill themselves at a gym in order to be fit and healthy. Thanks for helping spread this message. So much unnecessary pain and confusion. Hi Cassandra and chris, thanks. Unfortunately people don't usually listen, unless they have a health problem. I even have a hard time convincing members of my family! All we can do is show examples, and argue with logic and science. Most people will be willing to make a change only when they have a serious health problem. Sometimes there is still time, other times it is too late to avoid permanent damage. I've been interested in your posts on niacin and growth hormone. One thing I've wondered about, though--many websites out there caution against taking niacin if you drink alcohol. On the other hand, a bunch of others note that niacin in necessary for the metabolism of alcohol, and state that alcoholics are usually deficient in niacin. Do you have a position on the niacin and alcohol issue? That's where I want to get - a few more pounds, but only of muscle. It's tough! As for niacin, in large doses (1 - 3 g) it acts on the liver, temporarily suppressing (but not completing stopping) lipogenesis. Alcohol is used by the liver for lipogenesis; none of it becomes glucose or glycogen. In fact, the liver treats alcohol as a toxin, trying to process it right away. So you have two competing processes. If you drink a lot of alcohol after taking 1 g of niacin, thinks probably will not go well. Having said that, many times I had niacin with a meal, together with a glass of wine. Never a problem for me, as far as I can tell. Thanks for the niacin/alcohol info. I'd be inclined to take my niacin in the morning, exercise in the afternoon, and have a couple of glasses of wine at night, so it sounds as if I should be okay. As to the muscle gain while shedding weight, my main source of cardio has been Bikram or CorePower Yoga--intense cardio, but also a strong muscle workout as well. Once a week I go for a run and then hit the weight room. On the diet side, I initially stuck to a strict low-carb (Protein Power) approach, but I recently moved to one of the late phases of Jeff Volek's TNT Diet, where you eat low-carb six days a week and then do a carby day (but with plenty of protein) to drive nutrients into the muscles. My carb day is also my running and weightlifting day, so my glycogen is really depleted and the insulin spike has somewhere to pump all the goodies. Eating low-carb I only gained a small amount of muscle. Once I started the TNT approach (and added some whey and BCAAs), I put on about a pound a month of muscle while still losing a bit of fat. Not fast--lots of people get better results than that--but, hey, I'm in my late fifties, while most of Volek's study people were undergrads. Keep up the good work. This is a great blog. I also have a lot of distributed subcutaneous fat. I get the same, "You're not overweight" comment @ 6'4" 230#s. But I know I am. I doubt it's niceness. I figure people standard for "not overweight" has dropped over recent decades. I super curious about how to help subcutaneous fat loss now, since I have so much of it. Loved previous post on that. Been helpful. Actually several people asked me if I was ill, as I had lost so much weight. Many people associate being somewhat overweight with being healthy. Assuming an improvement in diet (i.e. reduce calories and keeping carbs below 150g/day), what's your thought on burning fat using High Intensity Training (working out near VO2 max)? The machines at my gym show that the fat burning zone is when the heart rate is at it's lowest. However, from what I can tell, high intensity training says the opposite.. it says that the higher heart rate workout will deplete the glycogen in the muscle, causing the pancreas/liver to stop storing sugar as fat, and instead release the stored grease. Which one is correct? But exercise in the aerobic range (e.g., walking) will burn more body fat than glucose (as glycogen) during the exercise session. Glycogen-depleting exercise will burn more glucose than fat during the session. Finally, exercise in general doesn't burn significant amounts of body fat. You can easily gain the calories back due to increased hunger. What exercise tends to lead to are hormonal and behavioral changes that in turn lead to body fat loss (e.g., people who exercise burn more fat through involuntary activities). In this respect, glycogen-depleting exercise (along or combined with aerobic exercise) seems to be superior. I'm very inspired by your weight loss and high energy. I'm curious about two things. You say you cook with butter - do you consume any other dairy? Also, do you make an effort to consume fermented foods? I regularly eat yogurt and aged cheese. These are the only fermented products that I consume regularly. The yogurt is plain, with no sugar added. I like the Fage brand. Occasionally I have dark chocolate, frozen yogurt (a bit like ice cream), and ice cream. I consider these to be "cheats", but no big deal. Your transformation has been great. I have been trying on my part, but I am not that strict and my transformation has also been not that great. I am just curious on why you are very much against eating vegetables that cannot be eaten raw. Humans have been cooking for a million years at least. I do understand that they could have cooked only vegetables that do not have too much water content, like tubers. I am not so much against eating them. I grew up eating cooked beans, which were always soaked overnight first. They still seem to be an okay food to me. The reasons I generally avoid them are that: (a) they tend to have toxins (which can nevertheless be reduced or removed); and (b) there are other convenient options available. I do make some exceptions though. Sweet potatoes, for example. SPs are also very nutritious; probably one of the most nutritious plant foods out there. Thanks for your reply about the dairy. Do you consume starchy veggies regularly? It sounds like you eat occasional sweet potatoes and white potatoes but what about parsnips, rutabagas, turnips, etc? How often do you eat soaked beans? I'd love to hear that you do eat starchy foods daily and they haven't compromised your health. I seem to have more energy with more carbs. I eat white and sweet potatoes, as well as yam and cassava root. It has been a long time since I ate any grain though. Starchy foods may lead to toxic levels of blood glucose for some people; and the number of people who experience this in Western countries seems to be increasing. Not for me, but I would avoid them if they did. Generally I think that if one does glycogen-depleting exercise on a regular basis, like I do, starchy foods and fruits are fairly healthy. That is, as long as the person is not insulin resistant. Just out of curiosity, about how many carbs do you usually consume per day/week? I guess about 100-120 g daily, on average. Some days I can have as little as 30 g, other days as high as 150 g.
how about fermenting the vegetables that you can not eat raw.. ?? Planning to do a diet similar to yours :) very happy to find like minded people on the internet ! Congratulations on your successful weight loss. I announced a year ago give-or-take that I had to lose some fat and develop some muscle. I drank diet shakes and ate protein bars and soy snacks and... gained fat and lost muscle. Then I tried counting calories, cutting in preparation for bulking later, and after a couple of weeks of being hungry all the time, shakes and feeling cold and too tired to exercise or even move at a normal speed, I gained about a pound. Probably water. Then I cut out potatoes (sob), almost all grain, almost all sugar and almost all artificial flavor enhancers.sweeteners (MSG, aspartame, maltitol etc. ), replacing those calories with meat, fish, eggs, fruit (unprocessed) and vegetables -- and suddenly have energy, stand up straighter and work out euphorically, while my waist shrinks. I think that most of the improvement in many diet "after pictures" is posture, and you need back muscles and energy for good posture. You can't get that from chemical diet shakes and calorie restriction.